1/8000 sec. to 30sec. (total shutter speed range; available range varies by shooting mode), Bulb, X-sync at 1/250sec. EOS 7D Mark II Kit (EF-S18-135mm f3.5-5.6 IS STM) : 1/8000 sec. to 30sec. (total shutter speed range; available range varies by shooting mode), Bulb, X-sync at 1/250sec. 1/8000 sec. to 30sec. (total shutter speed range; available range varies by shooting mode), Bulb, X-sync at 1/250sec. EOS 7D Mark II (Body) : 1/8000 sec. to 30sec. (total shutter speed range; available range varies by shooting mode), Bulb, X-sync at 1/250sec. 1/8000 sec. to 30sec. (total shutter speed range; available range varies by shooting mode), Bulb, X-sync at 1/250sec. EOS 7D Mark II Kit II (EF-S15-85mm f3.5-5.6 IS USM) : 1/8000 sec. to 30sec. (total shutter speed range; available range varies by shooting mode), Bulb, X-sync at 1/250sec. 55 milliseconds shutter release time lag and can clock continuous shooting speeds of up to 10 fps. EOS 7D Mark II Kit (EF-S18-135mm f3.5-5.6 IS STM) : 55 milliseconds shutter release time lag and can clock continuous shooting speeds of up to 10 fps. 55 milliseconds shutter release time lag and can clock continuous shooting speeds of up to 10 fps. 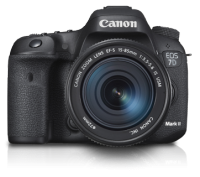 EOS 7D Mark II (Body) : 55 milliseconds shutter release time lag and can clock continuous shooting speeds of up to 10 fps. 55 milliseconds shutter release time lag and can clock continuous shooting speeds of up to 10 fps. EOS 7D Mark II Kit II (EF-S15-85mm f3.5-5.6 IS USM) : 55 milliseconds shutter release time lag and can clock continuous shooting speeds of up to 10 fps. 3 " EOS 7D Mark II Kit (EF-S18-135mm f3.5-5.6 IS STM) : 3 "
3 " EOS 7D Mark II (Body) : 3 "
3 " EOS 7D Mark II Kit II (EF-S15-85mm f3.5-5.6 IS USM) : 3 "
Center-weighted average and Evaluative metering with the image sensor * Automatically set by the focus method. 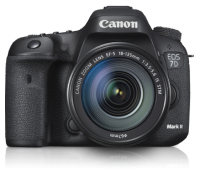 EOS 7D Mark II Kit (EF-S18-135mm f3.5-5.6 IS STM) : Center-weighted average and Evaluative metering with the image sensor * Automatically set by the focus method. Center-weighted average and Evaluative metering with the image sensor * Automatically set by the focus method. 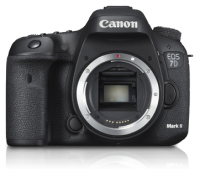 EOS 7D Mark II (Body) : Center-weighted average and Evaluative metering with the image sensor * Automatically set by the focus method. Center-weighted average and Evaluative metering with the image sensor * Automatically set by the focus method. EOS 7D Mark II Kit II (EF-S15-85mm f3.5-5.6 IS USM) : Center-weighted average and Evaluative metering with the image sensor * Automatically set by the focus method.